Earlier this month I announced that my performance of Tristan Tzara’s “The Death of Apollinaire” was the most popular piece here last fall. Seeing this, it’s past time to present a poem by Guillaume Apollinaire himself. If one was to draw a graphical map of the French Modernists of the early 20th Century, corresponding to the English-speaking ones we’ve been talking about a lot here, Apollinaire would be at a central place like Ezra Pound. Apollinaire knew everybody, he influenced everybody; as a critic, he wrote about everybody. Although, like Pound, he held strong opinions about what a more modern art needed, what little I know about how he was experienced as a living artist says that he was also loved by most everybody that he met as well. Like Tristan Tzara he was an example of a European, though his work was centered in Paris and he wrote largely in French. His mother’s family was Polish or Belarussian, depending on where the borders were drawn at any one time. His father’s background was never definitively known. Born likely in Italy, he had traveled and spent time in several countries, and spoke several languages, before settling in Paris before he was 20. 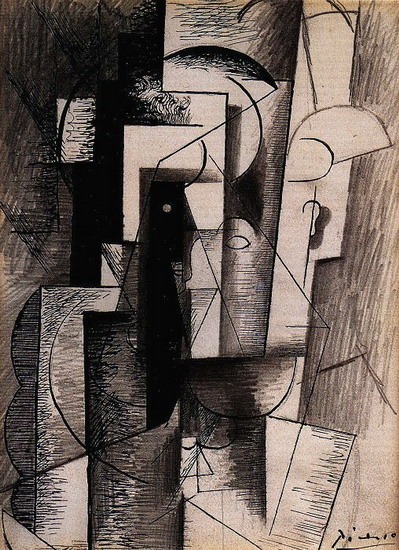 In the visual arts, he invented the word Cubism, and he also was the first to call his work Surrealist. He knew modernists in music, like Satie. He knew the young artists, like Picasso, Chagall, Henri Roussseau. Dadaists considered him an influence and a co-conspirator. In 1913 he published his best-known collection of poetry “Alcools” (Alcool is the French word for alcohol). In it, Apollinaire set out his direction in modern poetry, using various forms, often imbued with contemporary colloquial speech and connections to modern technology and urban life. One tic he adopted in “Alcools:” he dropped the punctuation from his poetry, emphasizing the flow of his words, an effect that could be seen as presaging a modern rapper’s unstoppable flow. Am I guessing at that? It just so happens, I’m not. 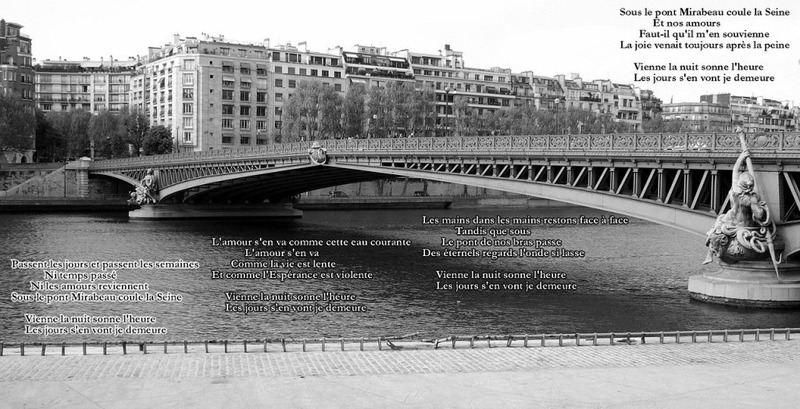 On Christmas Eve in 1913, Apollinaire was recorded reading one of the poems from “Alcools:” “Le Pont Mirabeau” (Mirabeau Bridge), and that recording, encrusted though it is with the scratch and noise of time, survives. So, today’s piece, with my music and my English translation of his words, leads off with Apollinaire’s own reading of his poem in French. Mirabeau was the longest bridge in Paris when it was built using using new steel-reinforced methods in 1893. Translating “Mirabeau Bridge” was a challenge. Having heard and been transfixed by Apollinaire’s intensely rhymed and recited version, I had to bend my usual translation approach, which skips any attempt to keep the original “music” (the rhyme and meter) of the poem. And as I look at the many attempts to translate this poem to English, I see most tried to at least rhyme it. The Pogues used a rhymed English translation for a nice sung version a few years back. Why do I usually skip trying to rhyme-up translations? It adds a great deal of difficulty to conveying the poem adequately. It almost always leads to awkward English, particularly when you try to follow a rhyme scheme from the French, with many more words that rhyme, using English, whose poetic tradition did not grow out of rhyming. Having been influenced by French poetry at an early age, when trying for similar effects I often use a variety of imperfect and near-rhymes, something an audience may accept or find grating, depending on their tastes, and that’s what I did here, along with a free and not regular rhyming scheme. Give a listen. Consider it a trip-hop battle between Apollinaire and myself. Respect to Apollinaire. Can’t bust his moves.